25 Feb 2019 --- French ag-tech innovator Ÿnsect, which specializes in turning farmed insects into ingredients for fish feed, pet food and plant fertilizers, has raised US$125 million in a Series C round of funding to build the “world’s biggest insect farm.” The company seeks to scale up production at its facility near Amiens, in northern France, which will be able to produce around 20,000 tons of protein per year. 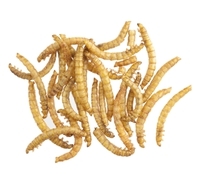 Ÿnsect also plans to develop the company’s international and North American markets to keep pace with the increasing demand for insect protein as part of a sustainable food system. Specialized in the farming of molitor, small common insects known as mealworms, Ÿnsect plans to begin construction on the farm later this year. The company was co-founded in 2011 by CEO and agronomist Antoine Hubert, Jean-Gabriel Levon, Alexis Angot and Fabrice Berro, with the aim of becoming the global leader in the market for alternative protein sources, while developing an industrial-scale solution attuned to natural ecosystems. Speaking with FoodIngredientsFirst, Hubert explains what’s behind the growing demand for insect protein and how the firm's entire production process is automated. “We’re still in the earliest stages of this sector, however, by building the largest insect farm in the world – in Ynfarm in Amiens, Northern France – this investment round will give us the resources to deliver significant volumes. At full capacity, it will enable us to meet the rising demand for protein by producing around 20,000 tons of insect protein annually,” he says. In addition to the nutritional value, insects have less of an environmental impact compared with more conventional sources of protein. “However, the key advantage with insect protein is you can produce more with far less: it takes less feed to produce the same quantities of protein, they are produced with fewer antibiotics and chemical fertilizers. And because the ultimate product is 72 percent protein, it is proven to be highly effective as fish feed or for pet nutrition.,” he says. Led by Astanor Ventures and backed by established international funds including Bpifrance, Talis Capital, Idinvest Partners, Finasucre and Compagnie du Bois Sauvage, Ÿnsect says this investment is the largest-ever ag-tech funding deal outside the US. Choosing the locations for the development of the new facilities was driven mainly driven by the availability of affordable and high-quality raw material to feed Ÿnsect’s mealworms, being close to an area with a skilled employment pool, as well as good access to utilities, energy and industrial maintenance services, Hubert notes. Hubert says the next step will be building Amiens Ynfram#1 and doing the groundwork for the industrial roll-out for Ynfarm#2, the company’s next farm, which will most likely be located in North America. Most of the fish eaten today comes from farmed sources. However, fishmeal, the primary food source for farmed fish, is in “crisis,” according to the company, because it’s derived from fast-depleting ocean fish stocks. Earlier this month, lobby groups called for an end to overfishing in the North East Atlantic following the publication of an overfishing league table listing the worst offending EU countries. This is part of a new report uncovering the member states most responsible for setting fishing quotas above scientific advice with Sweden topping this year’s table. Wild fish and crustaceans eat insects, which deliver an important source of high-quality protein and polyunsaturated fats as part of their natural diet. Hubert says the molitor is the only insect that can be raised at large scale and the sole species to ensure the delivery of premium unique products: ŸnMeal, extracted from molitor larvae, which delivers sustainable, premium nutrition for animals. The product has superior and proven nutritional performance and health benefits for shrimp, salmon, trout and sea-bass, among others, according to Ÿnsect. ŸnFrass is also made from molitor larvae castings, which is a premium fertilizer that also has proven positive effects on many different plants.